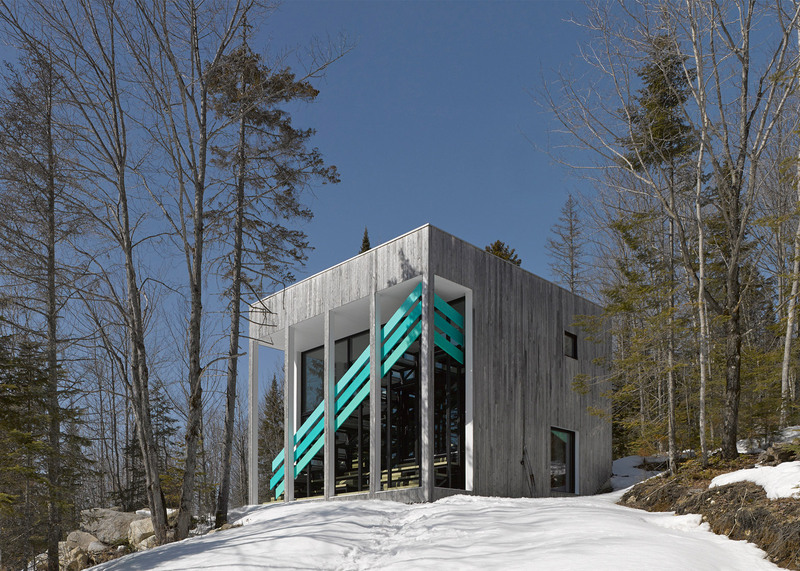 A turquoise staircase runs diagonally across the facade of this cube-shaped home in rural Quebec, designed by Montreal studio Architecturama (+ slideshow). 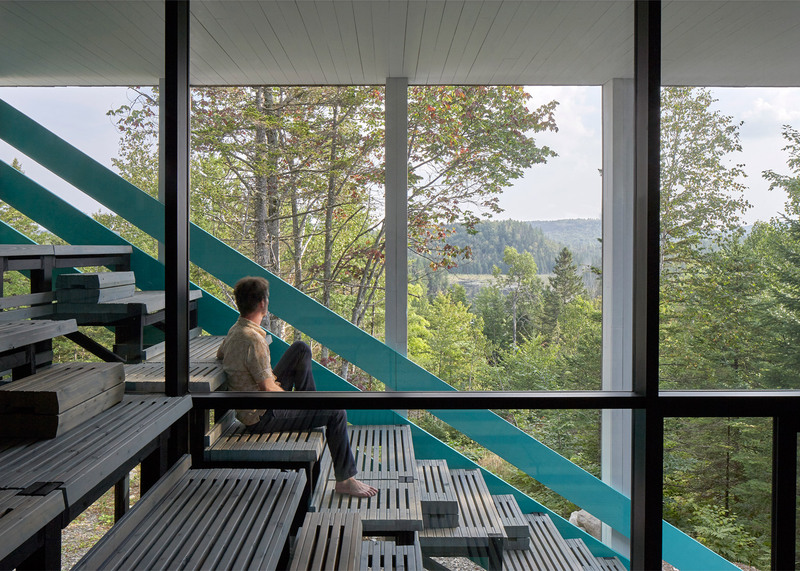 Called the Lake Jasper House, the dwelling is situated on a wooded, hillside property in the Canadian town of Chertsey. The compact house encompasses 80 square metres across three square storeys. "The owners were looking for a relaxed, welcoming environment, conceptually similar to a cottage yet more refined, particularly in the relationships among spaces and between people," said Architecturama. "The goal was to have a present, living and enthusiastic architecture that engages the senses." The home has a concrete frame, and is clad in white cedar and glass. 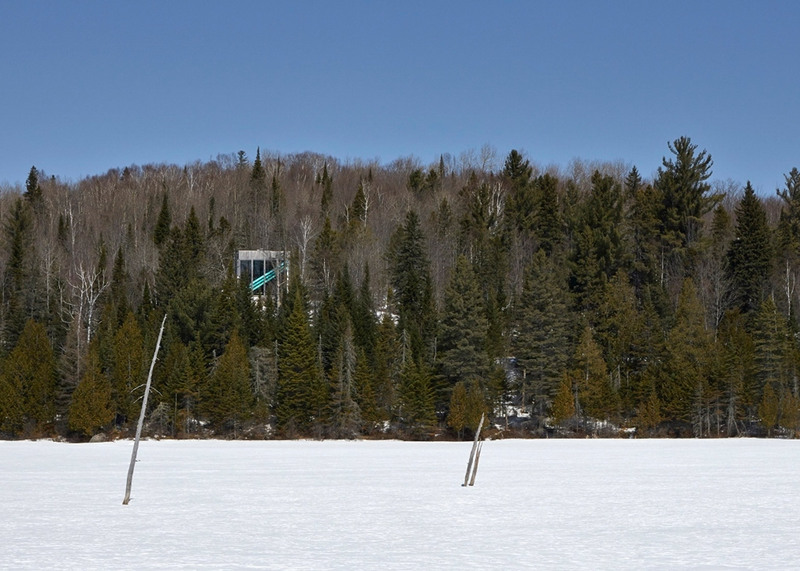 "The white cedar tongue-and-groove siding, sourced from a local sawmill, was left in its natural state," the firm noted. On the southern elevation, the architects placed an exterior staircase with a wooden blue railing that crosses the glazed facade. "It turns 90 degrees on the east side and penetrates inside the house," the architects said. 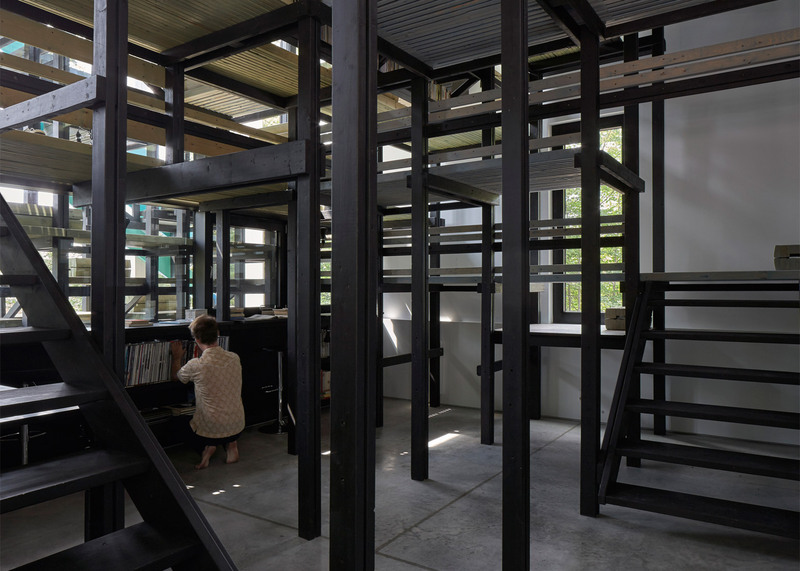 The house's most dominant feature is a modular bench system made of wood and metal, which the architects developed especially for the project. Conceived as "movable blocks," the modular units can serve as seating, end tables, back rests, steps or even room partitions. The architects used the system to form the exterior staircase and bleacher-style seating within the double-height living room, which also includes a fireplace, a movie projector and seating cushions. "Bleacher-style benches, meeting at right angles, are built into the main space," the firm explained. "They are simultaneously oversized furniture: an agora, a circulation area, filters, dividers, bookshelves and structural elements." "At the top, the benches make it possible to enjoy the view while maintaining physical and visual continuity with the ground." The benches were also used in other areas of the home – they form food preparation areas in the kitchen, and also create a dining table with enough space to seat up to eight people. The system's slim columns are meant to resemble "trees in the forest", the firm said. The interior of the home is divided into two programmatic areas. Private rooms are clustered on the north, while more communal areas – such as the living room – are situated on the south. 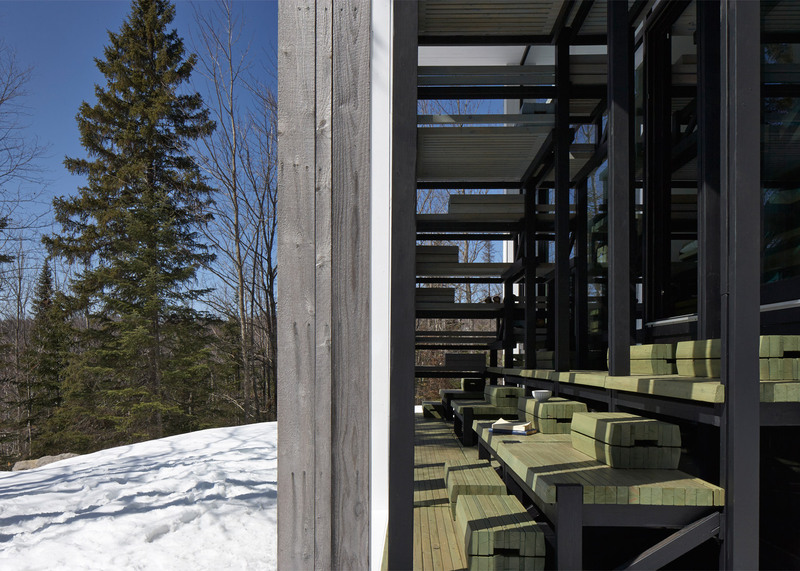 The south-facing glass facade also enables sweeping views while maximising solar heat gain in the winter. "A large overhang, designed to make use of the changing angle of the sun, prevents overheating in summer while admitting as much winter sunlight as possible," the firm added. 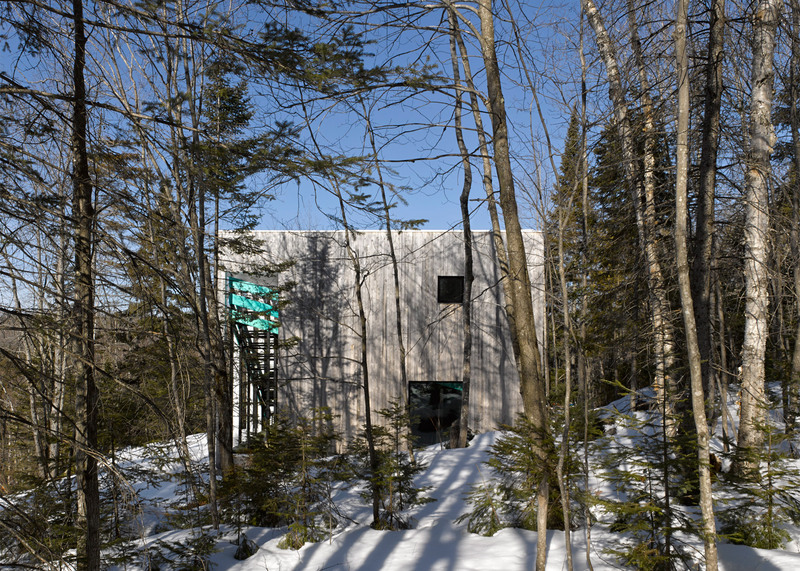 Other recent residential projects in Quebec include Le Bic House by Naturehumaine and the KL House by Bourgeois Lechasseur Architects.